Over the last year here in the UK open source has seeped into our government infrastructure and is now part of the school curriculum, championed a good deal by the Raspberry Pi foundation. 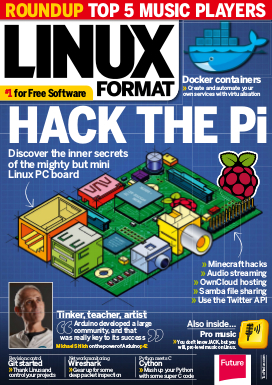 To help celebrate this fortunate turn of events we're exploring how you can hack Linux on the Pi to ever greater levels with fun projects, advanced Linux services and essential skills, we hope you've brought your Pi with you. Not that we want to obsess on the Pi too much, it's a great device that's changing the world, but part of that success is its Linux smarts. We're finishing our Nginx series, we're also going deep into Cython to accelerate everyday Python, exploring how to use Git for your own projects and look at how you can get started developing PHP. We're also trying to stay musical with a roundup of excellent players and even pro-level production with JACK. Plus even more advanced tutorials, reviews and a packed DVD.